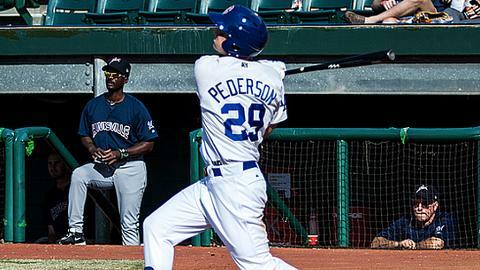 Joc Pederson turned 21 this month and is the second-youngest position player in the Double-A Southern League. But when you watch the Chattanooga outfielder, don't expect many youthful mistakes. If fact, it is just the opposite. "He has a feel for the game this is rarely seen at that age," Lookouts manager Jody Reed said. "He has incredible instincts. I played against Ken Griffey Jr. when he first came up, and he reminds me a little of Junior in that way. Only a few players have it. Look at Mike Trout and Bryce Harper today. I'm not comparing Joc to players like that, but he has that special feel for the game and it's fun to watch." Pederson is ranked as the Los Angeles Dodgers' No. 3 prospect, according to MLB.com, and he has lived up to the billing at Chattanooga. The California native was hitting .301 through Sunday and led the Southern League in OPS at .993 thanks to a .379 on-base percentage and .614 slugging mark. His five homers were tied for the most in the SL and he had 15 RBIs, despite batting from the leadoff spot. And when he wasn't playing long-ball, Pederson was 7-for-7 in stolen base attempts. No wonder that Reed, formerly a Major League infielder with the Boston Red Sox and four other teams, is so high on the left-handed hitter and thrower. "I don't think there are any weaknesses in his game," the manager said. "He's just a very good all-around player, and he loves to play baseball." Pederson may be the steal of the 2010 Draft, when he lasted until the 11th round before being taken by the Dodgers out of Palo Alto High School. "I guess teams didn't think I was worth the money," said Pederson, who had signed with the University of Southern California and could have played football as well as baseball with the Trojans. But the Dodgers went well over slot to sign Pederson to a $600,000 bonus, and it looks like money well spent. Pederson won the Branch Rickey Award as the Dodgers' Minor League Player of the Year in 2012 after hitting .313 with 18 homers, 70 RBIs and 26 stolen bases for Rancho Cucamonga in the Class A Advanced California League. Pederson was promoted to Chattanooga for the Southern League playoffs, and that gave him a head-start going into his first season of Double-A. "I knew a little bit what to expect, which was good," he said. But in truth, Pederson has been preparing for his baseball career his whole life. His father, Stu Pederson, spent a dozen years in the Minor Leagues and reached the Majors briefly with the Dodgers in 1985. Then there were two older brothers with whom Joc tried to keep pace from an early age. "If you know how to play the game right, I don't think it matters how old you are," the Chattanooga outfielder said. But Pederson's baseball development got an extra boost last fall by playing for Israel in the World Baseball Classic qualifying tournament. His team almost advanced, losing to Spain in the deciding game. "The atmosphere was great, and it was a lot of fun," Pederson said. "The games were very intense." Of course, the ultimate goal is to reach Los Angeles, and Pederson appears to be on the fast track. Although Pederson prefers center field, he has also seen time in both corner spots as Reed moved his outfielders around extensively until Cuban defector Yasiel Puig, the Dodgers' No. 1 prospect, went on the disabled list with a sprained left wrist. "We want to make sure they are prepared no matter where the opportunity is," Reed said. With Pederson, though, no learning curve has ever been a very steep one. Zeroed in on record: Mississippi LHP Alex Wood blanked Huntsville over five innings on Saturday to push his scoreless streak to 18 2/3 innings -- a franchise record. Right-handed pitcher Tommy Hanson, now with the Los Angeles Angels, set the previous mark of 17 2/3 innings in 2008. Wood is 1-1 with a Southern League-best 0.67 ERA and has 31 strikeouts to five walks in 27 innings. Mississippi backed Wood, the Atlanta Braves' No. 6 prospect, with three homers against Huntsville after hitting just seven in the previous 22 games. Human after all: Birmingham center fielder Jared Mitchell landed on the disabled list Friday with a strained oblique two days after making a flying catch that manager Julio Vinas likened to a superhero move. "It was a Superman dive," Vinas told the Birmingham News. "He must have been three, four feet off the ground." Other than the catch and a homer the night before, little has gone right for Mitchell this season. The Chicago White Sox's No. 5 prospect was demoted from Triple-A Charlotte after batting .132 in 14 games and has a .214 average in five games with Birmingham. Homer tear: Jacksonville right-fielder Marcell Ozuna missed the start of the season after breaking his left hamate bone, but the Miami Marlins' No. 6 prospect is certainly making up for lost time. Ozuna hit his fifth homer in five games and had his second four-RBI game in the stretch as the Suns defeated Mobile, 14-6, on Sunday. He followed up two homers Wednesday with homers the next two games before being quieted briefly on Saturday. In his first 10 games with Jacksonville, Ozuna had 15 RBIs and was batting .333.